AN analysis by Anthony Cox of a letter sent by Greg Combet to a member of the public. This is a letter sent by the Minister for Climate Change and Energy Efficiency Greg Combet to a constituent who requested information about the science which the government relies on to justify its proposed measures to combat anthropogenic global warming [AGW]. 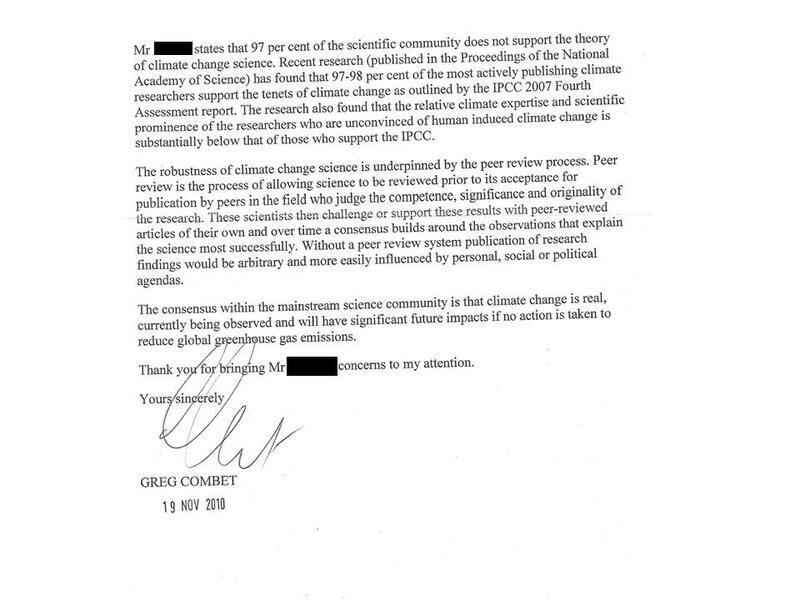 This letter should be viewed as the government’s official position on AGW and its justification for the measures it is implementing and proposing to introduce to ‘solve’ AGW. A response to Mr Combet’s letter follows. Response by Anthony Cox to Mr Combet’s Letter. Combet has written a superficially clever letter. It justifies by exclusion; the mechanisms of exclusion are authority and consensus; validity is thus defined by designation from above and from ‘below’ by group acceptance of the authoritative pronouncements. This is a closed loop with each part of the loop vindicating the other; the loop is an attempt to create a priori knowledge by reliance on the authoritative source and the group acceptance. People who do not accept the authority or who are not part of the group acceptance have no validity and are at best ignorant of the knowledge of the ‘loop’. As I will show each of Combet’s examples of authority and consensus are contradicted by observed exceptions and his justification for the government’s measures to combat AGW is therefore flawed. 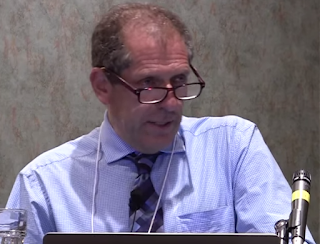 The salient point about the IAC’s findings is that if the IPPC’s standards of certainty are wrong then that means the scientific basis of those standards is problematic: if “mid-20th Century” warming is NOT “very likely” due to “the observed increase in greenhouse gas concentrations” then the basis of AGW is compromised. The IAC is an internationally recognised source of scientific expertise. For Combet to ignore its findings shows that he is either getting bad advice or ignoring good. The audit found that 21 of AR4’s 44 chapters had 59% or less of their official sources non peer-reviewed; in many of those instances organisations such as Greenpeace or the WWF were the source. Overall no chapter of AR4 had their scientific sources entirely peer-reviewed and the high concentration of references from groups with a green ideology means that the scientific credibility of AR4 was severely diminished. Harris and McLean note that only 5 independent scientific reviewers contributed to the vital chapter 9. Nor is there any mention of the Wegman report which revealed the deep flaws in Mann’s study and the controversy about Mann’s data and methodology. These are egregious oversights. Arrhenius was a genuine scientist, but his so called proof of the influence of “carbonic acid” or CO2 was wrong in several profound ways. Firstly, he confused radiative loss with convective loss because he believed the glass container was impermeable to radiation. Arrhenius also did not understand that CO2 did not transmit radiation but in fact absorbs and reemits it for no net gain. 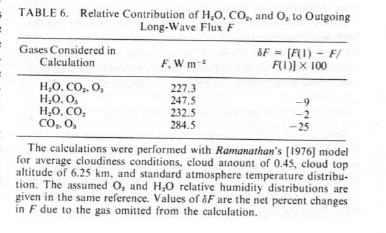 Arrhenius’s experiment to test CO2’s heating properties used radiation limited to 9.7 microns, which is the wavelength at which water vapour is active, and at 100°C; he was unaware that CO2’s active thermal spectrum is at 14.77 microns and that radiation at such temperature is not representative of Earth’s radiative spectrum. There are then, two crucial aspects of the Paltridge/Dessler debate which have been ignored by the ACS report. The first and most obvious is that there is a debate. There is no mention in the ACS report about the basic contradiction between Dessler and Paltridge. The second aspect is that there has been recent research which tends to support Paltridge. If Dessler is right and more water vapour is occurring at the mid levels of the atmosphere then this would support a fundamental prediction of AGW, the Tropical Hot Spot [THS]. AGW says that with CO2 induced warming extra water will be evaporated, especially in the Tropics, with a rapid warming produced in the mid levels of the atmosphere due to the presence of the extra water vapour [see Figure 9.1(c) AR4]. This would create a THS. McKitrick et al show that the models are wrong and that there has been no temperature increase consistent with a THS. This is a groundbreaking paper published in a top climate science journal but the ACS has not referred to it. Not only does McKitrick’s paper remove one of the tenets of AGW but it gives support to a strong argument against another tenet in the form of Paltridge’s work. Despite this spokespersons for Combet and indeed Combet himself continue to claim that AGW is worsening. Yet the evidence is plain that this is not true. As Dr Goklany notes The Royal Society report basically relies on IPCC conclusions without even referring to some of the provisos contained in AR4. In short it is a “me too” charade. Many of the particular site locations which are used to calculate state and national records have shown, in their raw, unadjusted data, declines in temperature over the 20thC. More generally however, the consensus and authority arguments are the antithesis of scientific endeavour as enunciated by Richard Feynman. The system which Combet relies on to provide his authority and consensus is riven with faults and corruption; it is undermining the integrity of science. 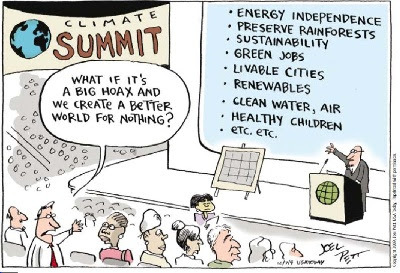 It will take a brave man to question the direction of the AGW debate. Combet, who lives by the ocean, is obviously not such a man. 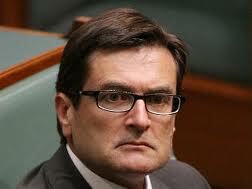 Greg Combet is the Australian Minister for Climate Change. Anthony Cox is the Secretary of The Climate Sceptics party. He says it’s getting hotter year by year. You’re so wrong wrong, Greg, you’re so wrong, wrong. 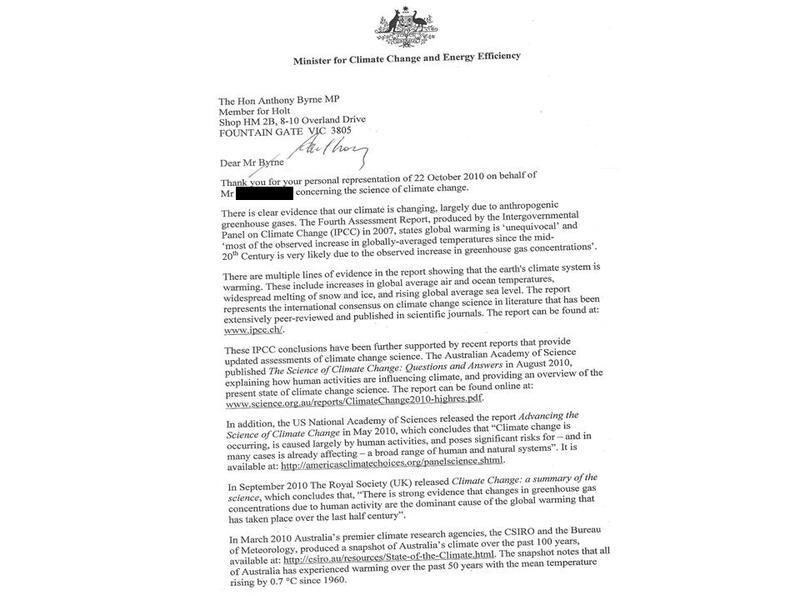 Thanks, Anthony for the rebuttal of of the letter from our waterfront dwelling Minister for Lies and Nonsense, which is also a thorough update on the AGW saga generally. Abbeviated letter sent to a local MP. The thrust behind the call for a Royal Commission are the evidences of malfeasance by various parties around the world. I appreciate that some of the malfeasances would be outside the jurisdiction of Australia, however, they all point to the same theme of so called Catastrophic Anthropogenic Global Warming. Responsible scientists say that if there are any human effects they are so tiny that they cannot be measured. People alone breathe out around 3 billion tonnes annually, of carbon dioxide, and put this into the atmosphere. Some examples of potential malfeasances. 1. The admission by the NIWA (New Zealand) that the official temperature records have been manipulated to give a warming bias. Officially, there has now been no temperature increase in NZ for 50 years. Note that these records, I understand were audited by our BOM (Bureau of Meteorology). The corrupted records have been used to compile the world’s temperature. The publishing of a graph by the CSIRO and BOM jointly, showing dramatic increases in carbon dioxide and methane in the atmosphere. However, cunningly, it would appear, the record for methane was chopped off for the last 10 years. Was this because the levels of methane have actually declined? Methane is a very effective greenhouse gas but is measured in parts per billion. 2. Constantly, we have the environment reporter, Sarah Clarke for the ABC, whenever she is doing a story on climate change, standing in front of a power station, or has pictures of power stations belching what is implied, is pollution. Has Clarke set out to deliberately mislead, or is she ignorant of the facts? The towers belching the white stuff are actually belching condensed water vapour. The process that creates the white stuff is the same process that creates clouds. Warm air containing water vapour cooling to the point where the vapour condenses to form visible moisture. Most of the towers in the pictures are cooling towers. 3. Then we have the Michael Mann “hockey stick” temperature graph which was trumpeted in AR4, by the IPCC, with great fanfare as proof of rising world temperatures. The graph has been subsequently proven to be a fraud. 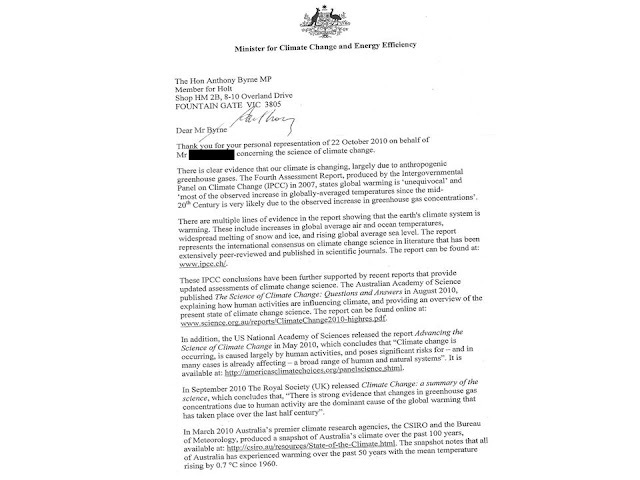 I understand that the Australian Government makes contributions to the IPCC through the UN. 4. We also have the keeper of the temperature records at East Anglia University, UK who, it appears, has “conveniently” lost the raw data so no one can check how he has adjusted temperatures. 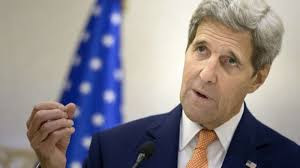 He now admits that over the last 15 years there has been no significant increase in the world’s temperature. 5. There is the documented problem with the bad placement of recording stations, in the US, where they are often too close to artificial heat sources. This serves to give artificially high temperature recordings. 6. In Australia there are indications that old temperature records have been adjusted downwards. This creates an impression of later rising temperatures: We need to know why this was done. Was there something wrong with the records from 50 years ago? 7. We have the MDB Authority telling us that there is deceasing rainfall in the basin. A look at the BOM records will tell you that this is not so. The last 50 years of the last century saw more rainfall than the first 50 years. Unfortunately, time and convenience do not permit the raising of more points, to expose the potential malfeasance and corruption by others. This would turn into a book! With respect, the idea that an issue is divisive, is not grounds for not calling for a Royal Commission. The most important thing, no matter what the issue is, is the truth! Two of my great concerns with this issue is that dishonestly gets a leg up and the squandering of huge amounts of public money, chasing a chimera. You may well say that you are responding to "community concerns". But what if the community has been misinformed? The whole issue of so called global warming/climate change has been funded, in one form or another, by government.